The Director of Research (Agriculture) coordinates the research activities in the field of Agriculture and Community Science. The research activities in agriculture and home science are being undertaken in different departments of the constituent colleges belonging to the two faculties as well as in the six Regional Agricultural Research Stations (RARS) and three Commodity Research Stations (CRS). Constant efforts are being made to address the demand-driven issues in all possible areas. Presently, more than 150 research projects including the AICRP/AINP are in operation in the Faculty of Agriculture and Community Science. The Directorate of Research (Veterinary) was established in the year 2.4.1989. Previously, this Directorate was designated as Associate Director of Research (From 27.3.1973 upto 2.4.1989). At present this Directorate is manned by one Director of Research (Vety) and one Deputy Director of Research. This Directorate is responsible for planning and overall research activities pertaining to livestock and fisheries of AAU. RARS, Titabar: Established in 1923 as a Rice Experimental Station, this became a part of the University in 1980 to conduct research in Upper Brahmaputra Valley Zone (UBVZ) comprising of Tinsukia, Dibrugarh, Sivasagar, Jorhat, and Golaghat districts. The station is located at Titabar town which is about 20 km south of the Jorhat campus of AAU. RARS, Shillongani: This station was initially established to work on pulse crops, oilseed crops and jute under the State Department of Agriculture. The station was transferred to the University in 1973 and was reorganized in 1980 as the Regional Agricultural Research Station for the Central Brahmaputra Valley Zone (CBVZ) which comprises of Nagaon and Marigaon districts. The station is responsible primarily for conducting research on pulses, oilseeds, jute and allied fibres and wheat. It also conducts research on boro rice. RARS, Gossaigaon: Established in 1980, this centre caters to the research need of Lower Brahmaputra Valley Zone (LBVZ) comprising of Kamrup, Nalbari, Borpeta, Goalpara, Kokrajhar and Dhubri districts. This is the lead station for entire Assam in respect of research on crops like buckwheat, niger, linseed etc. RARS, North Lakhimpur: Established in 1980, this station works for the North Bank Plains Zone comprising of Lakhimpur, Dhemaji, Sonitpur and Darrang districts. It serves the lead function for research on deepwater rice and diaraland agriculture for the entire state. RARS, Karimganj: Established in 1913, this station was transferred to the University in 1973 for research in the Barak Valley Zone (BVZ) comprising of Cachar, Karimganj and Hailakandi districts. The station is still mainly devoted to research on rice. RARS, Diphu: Located at Diphu, this station was converted in 1980 to a RARS for the Hill Zone (HZ) comprising of Karbi Anglong and North Cachar districts.The station is presently conducting research for the zone primarily on rice, vegetables, maize, tuber crops, and millets. Horticultural Research Station, Kahikuchi: This station was established in 1950 primarily to conduct research on coconut and was transferred to the University in 1973.This is now a leading research station for the horticultural crops. Sugarcane Research Station, Buralikson: The Station came into existence in the year 1969 for conducting research on sugarcane. This farm was earlier owned by the State Department of Agriculture which was later transferred to the University. Citrus Research Station, Tinsukia: The North Eastern Region is an important part of the centre of origin for citrus crops with enormous variability. Considering the importance of the crop, the Citrus Research Station was established at Tinsukia in 1976 to conduct research on all aspects on citrus. Goat Research Station, Byrnihat: This station, located 18 km away from the College of Veterinary Science at Khanapara, Guwahati; was established in the year 1978 with the mandate of carrying out research on Assam hill goats as well as developing suitable cross bred variety using proven Indian goat breed. Livestock Research Station, Mandira: Located 110 km northwest of Guwahati, this centre was established in 1981 with the mandate of developing a livestock based farming system. Presently a plan for developing intensive Integrated Farming System in this centre has been taken. The University follows a well laid out Research Management System to systematically carryout need based, demand driven, situation specific and problem oriented research. 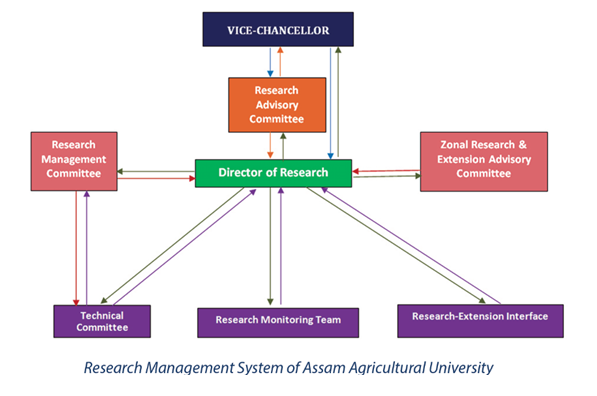 Under the current management system (Figure below), the research problems are identified based on the information collected by the scientists from the farmers’ fields and also on the basis of the feedback received from the line departments of the state government. The system ensures project based funding and effective monitoring of the programs to make them sharply focused to the relevant problems only.